The world of pomology can be a bit strange. Take, for example, consider the quince fruit (Cydonia oblonga). It may sound unpleasant at first, but you essentially have to let this fruit start to rot (a process called bletting) before they are ready to eat or else they will be too acidic. Don't worry though -- bletting is not harmful and the results are delicious. Some eat the fruit fresh, but it is often used in cooking and made into jams and jellies. This fruit has been placed into its own genus and is known as Cydonia oblonga. Sometimes you may see it noted as Cydonia vulgaris. 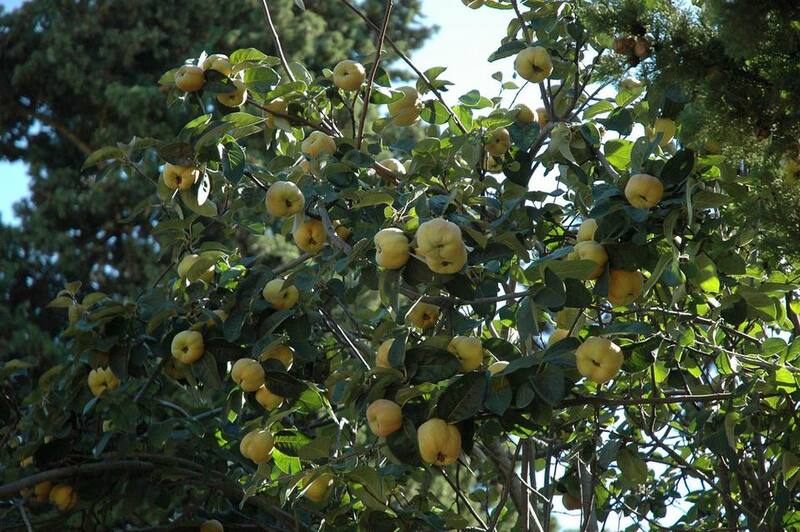 It is part of the Rosaceae family and a close relation to apples and pears. If you are looking for its relatives, the flowering quinces, they are now in the Chaenomeles genus. This is called the fruiting quince since it is grown primarily for its edible fruits. You can plant quince fruit if you live in zones 5 to 9. It may also be able to grow in zone 4 with some protection from frost. This will be a large shrub that is 10' to 12' tall and wide at maturity, creating a rounded shape. The quince fruit loves to grow in a location that provides full sun, though it can handle some shade. The oval leaves are about 2" long and fuzzy underneath. The white or pink flowers are like most in the Rosaceae family and feature five petals with a multitude of stamens. The quince fruit is a pome, similar in appearance inside to an apple or pear. On the outside, it is sometimes shaped much like a pear. It can also be rounded. Choose an area with soil that drains easily for optimal growth. You won't need to worry about having more than one as far as pollination is concerned since the quince is self-fertile, though cross-pollination with a different variety can help ensure a robust crop. The number of chill hours for Cydonia oblonga depends on the variety, but less than 500 are required overall. This can be used as a rootstock to create dwarf pear trees. Once you have pruned your quince to have an open center, there shouldn't be much pruning needed beyond that. Go easy on the fertilizer unless tests or plant growth indicate it is needed. Too much nitrogen can encourage fire blight to settle in. Cydonia oblonga is susceptible to many of the same problems that apple trees face. Marauding pests include aphids, moths, the quince curculio, scales, and lacebugs. One disease that may strike is fire blight, which is caused by Erwinia amylovora. Infected areas should be removed from the shrub. You may also see black rot or black spot.